A copy of that report is is on the WWALS website. For the original Air Force source, scroll to the bottom of the previous post. The report states military bases across the country used compounds known as per- and polyfluorinated alkyl substances (PFASs) in fire extinguishing foam since the 1970s. Indeed, this is not just a Moody AFB problem. And not just an Air Force problem. Map: TOXIC FLUORINATED CHEMICALS IN TAP WATER AND AT INDUSTRIAL OR MILITARY SITES, by EWG. The VDT story continues with quotes from Kevin Chambers of the Georgia Environmental Protection Division (GA-EPD) who said that these PFASs are emerging substances. That just means we didn’t know until recently that they were health problems, even though PFASs have been widely used for decades. The VDT notes that the U.S. Environmental Protection Division in May 2016 issued a health advisory saying 70 parts per trillion was too much for drinking water. U.S. EPA: Health Effects, in PFAS, What You Need to Know. PFOA and PFOS are fluorinated organic chemicals that are part of a larger group of chemicals referred to as perfluoroalkyl substances. They were used to make carpets, clothing, fabrics for furniture, paper packaging for food and other materials (e.g., cookware) that are resistant to water, grease or stains. They are also used for firefighting at airfields and in a number of industrial processes. Both PFOA and PFOS are persistent in the environment and in the human body. Over time both chemicals have become widely distributed in the environment and have accumulated in the blood of humans, wildlife, and fish. Studies indicate that exposure to PFOA and PFOS over certain levels may result in adverse health effects, including developmental effects to fetuses during pregnancy or to breast-fed infants (e.g., low birth weight, accelerated puberty, skeletal variations), cancer (e.g., testicular, kidney), liver effects (e.g., tissue damage), immune effects (e.g., antibody production and immunity), and other effects (e.g., cholesterol changes). It’s also not even just traditional PFASs. About a decade ago, replacement chemicals for PFOA, known as GenX started to be used. Then EPA found that GenX turns out to be nearly as toxic as PFASs. 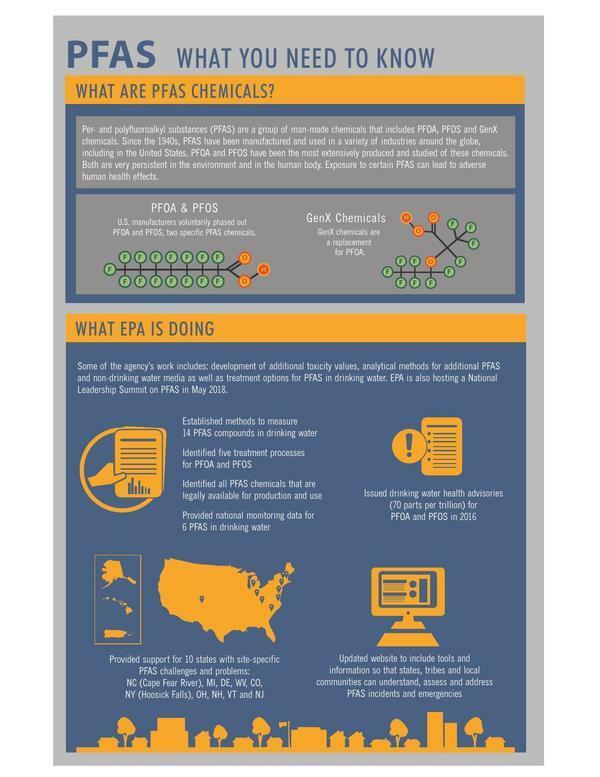 U.S. EPA: What are PFAS and GenX? 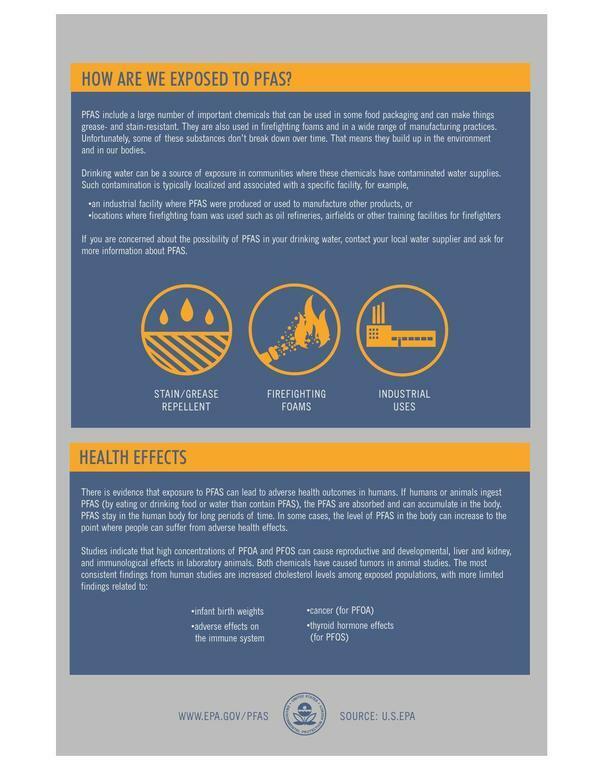 in PFAS, What You Need to Know. He said the chemicals do not degrade under typical environmental conditions and are extremely persistent in the environment. So nevermind that Moody AFB report was from 2016: the chemicals are probably still around. And if they’re in groundwater, as Moody’s own report said they were, they have probably been travelling underground all this time. How far and to where, nobody knows. Testing is needed. For many chemicals, the obvious place to turn to for water well testing is the University of Georgia (UGA) Cooperative Extension Service. A few years ago they helped test wells for arsenic, and the form for that and lead is W3CC Water Submission Form, Private Well Chemical Test (Recommended by the Georgia Department of Public Health). That test costs $122 per sample. The Georgia Department of Health (DPH) and WWALS continue to recommend that test. Contact the Lowndes County UGA Extension Office, 2102 East Hill Avenue Valdosta, GA 31601, uge4185@uga.edu, 229-333-5185. But testing for PFASs is not so easy. County Agent Jake Price checked all the way to UGA Athens, and UGA Extension does not do PFAS testing. I asked Kyle Coppage at DPH South Health District, who referred me to Frank Sanchez, Director, DPH Chemical Hazards Program, who says that only a very few companies in the U.S. do such testing. Two of them are Eurofins and Test America (also recommended by Jake Price). Cape Fear Riverkeeper says there’s also Parsons. Sanchez of DPH says the test to do is EPA Method 537.1.1. Test America confirms they do such testing. It costs $325 per test, but they don’t do it on a retail basis, as in you can’t just have your individual well tested directly with them. Normally they work though environmental testing firms, because you can’t just put water in a bottle and send it to them. The test water collection has to be done by someone wearing only certain types of clothes and gloves, with no cologne or perfume, because PFASs are in numerous clothing materials, especially water-repellant fabrics, not to mention fast food wrappers and nonstick cookware. As both Frank Sanchez of DPH and David Fuller of Test America told me, there is probably not any individual in the U.S. who does not already have PFASs in their body. It’s everywhere, from the artic to Antarctica. Yes, polar bears have been found with PFASs. However, that does not mean anybody needs to drink or eat any more of these chemicals. You can even absorb them through your skin. Eating contaminated fish could also be an avenue. So testing is needed. That EPA factsheet shown above says EPA has provided assistance to 10 states, including to In Upstate NY village of Hoosick Falls, a trail of cancer leads to tap water, AP, 26 Jan 2016. 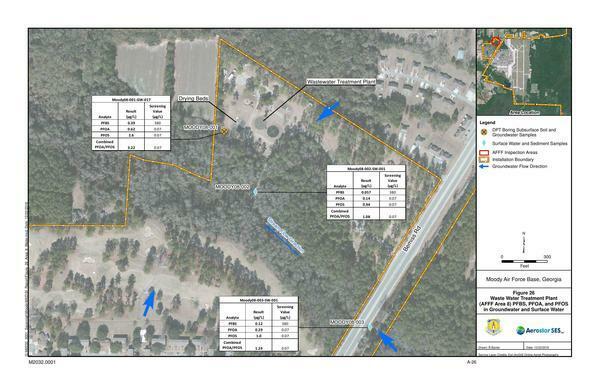 Also U.S. EPA assisted Cape Fear, NC. Dana Sargent, Cape Fear Riverkeeper, aka Cape Fear Riverwatch, is sending useful information and contacts, and she says U.S. EPA did help, after public outcry, with testing that was paid for by the polluting company, in their case Chemours. Here is some testimony to the U.S. House of Representatives. See also Cape Fear River Watch Sues Chemours Over GenX, Other Substances, Northeastern Univesity, from WilmingtonBiz, Cece Nunn, 29 August 2018. 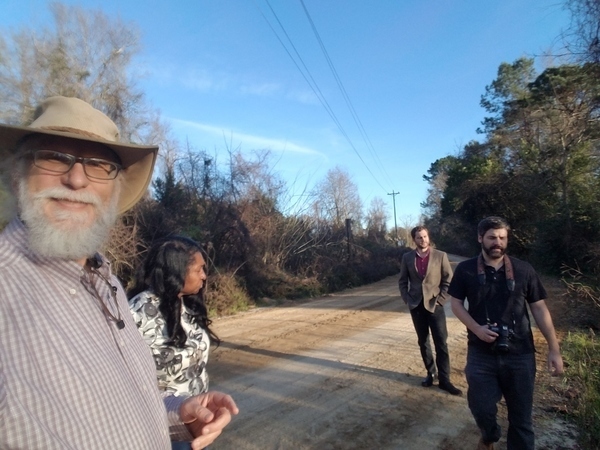 In July, the Southern Environmental Law Center announced that it had filed a lawsuit against the N.C. Department of Environmental Quality on behalf of Cape Fear River Watch, claiming the state agency should use its authority to require Chemours to immediately stop all emissions and discharges of GenX and other related compounds. Wilmington, Delaware-based Chemours shared plans earlier this year to make an investment of $100 million into the Fayetteville Works facility in a long-term effort to reduce emissions of GenX and other related compounds. So previous pressure apparently got the polluting company to do something about emission reductions, but not enough, and eventually Cape Fear River Watch sued. Let’s hope attorneys are not required hereabouts. Mark Lander, the head of the Marion County Department of Health… gave them a couple of cases of water and told them to drink only bottled for the foreseeable future before he disappeared back into the night. That’s one approach. I’m also told by Sanchez and Fuller that activated charcoal filtration can remove at least some PFASs from your water, if you are careful to change the filters. According to the Miami Times, the Florida Department of Environmental Protection (FDEP) installed filters for some wells after the Marion County, Florida, Department of Health tested for PFASs from that the Ocala Fire College. 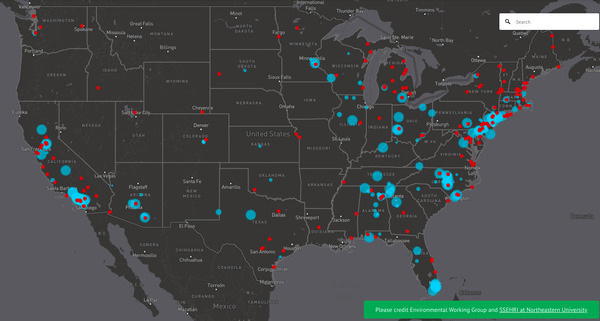 Map: TOXIC FLUORINATED CHEMICALS IN TAP WATER AND AT INDUSTRIAL OR MILITARY SITES, by EWG. 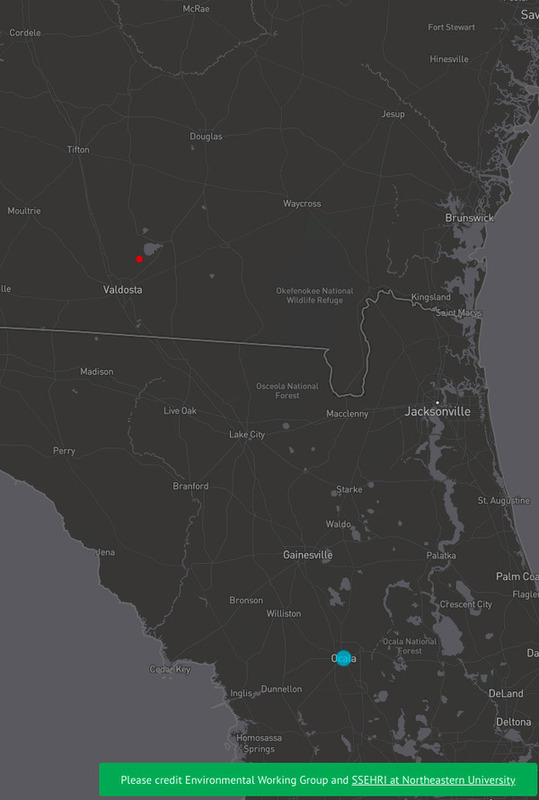 Ocala is the big blue circle at the bottom of this detail map. Moody AFB is the red dot towards the top left. Moody AFB has been quite clear that they did not test private wells, because there are no legal requirements for them to do so. According to U.S. EPA, there are some PFAS Laws and Regulations. Obviously they do not go far enough. The Ocala situation is bad enough to get the attention of a member of Congress from another Florida district: Wasserman Schultz calls for more federal regulation after dirty Ocala water makes news, Samantha J. Gross, Miami Herald, 8 January 2018. U.S. Rep. Debbie Wasserman Schultz called out to the U.S. Environmental Protection Agency and U.S. Attorney General’s office Tuesday, requesting they establish a proper system for regulating, monitoring and notifying people of water contamination in their area. I’m not sure where she’s been, since there are already a pair of bills in Congress, for detection and cleanup. 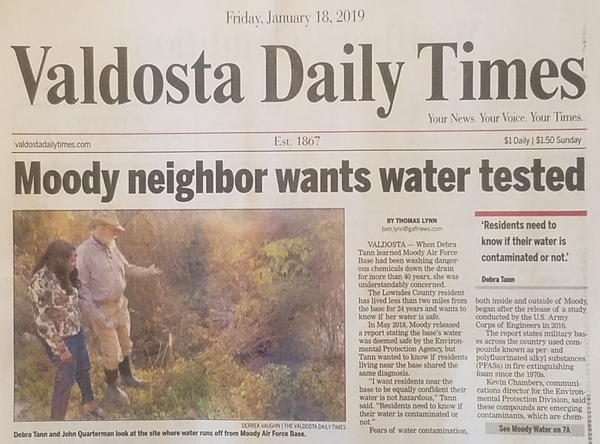 “Bill seeks $50 million to identify PFAS in U.S.”, Paula Gadner, mlive, Updated Dec 12; Posted Dec 12. US lawmakers’ bill would trigger cleanup of PFAS; Legislation would designate all per- and polyfluoroalkyl substances as hazardous, Cheryl Hogue, Chemical & Engineering News, JANUARY 15, 2019 | APPEARED IN VOLUME 97, ISSUE 3. Similar bills were tried last year, S. 3382 (detection) and S. 3381 (accountability). It’s time to get them passed. You can call your members of Congress. The Department of Defense has transferred $10 million to a federal agency so it can move forward with the first national health impact study on people exposed to PFAS chemicals in their water, Sen. Jeanne Shaheen announced Monday. The DOD transferred the money to the Agency For Toxic Substances and Disease Registry for the study Shaheen established in the fiscal year 2018 National Defense Authorization Act. Shaheen, D-N.H., a member of the Senate Armed Services Committee, also secured authorization to fund the study that the ATSDR will be conducting. That’s not much for the entire country, but it does establish that DoD can provide funding to deal with a problem that emanates from its bases, among other sources. DoD will be more likely to do this if Congress demands it. State funding to respond to perfluoroalkyl and polyfluoralkyl substances (PFAS) environmental contamination in Michigan was first appropriated by the legislature in December 2017 in the amount of $23.2 million GF/GP. In the current fiscal year, FY 2018-19, $8.0 million GF/GP is appropriated for PFAS response activities, with additional funding available which may be expended for PFAS or other similar purposes. The Governor requested an additional $43.1 million GF/GP and $15.0 million in proposed fee revenue in Supplemental Request 2019-1. The Michigan Department of Environmental Quality (DEQ) and the Michigan Department of Health and Human Services (DHHS) administer PFAS funding and programs. Cape Fear River Watch tells me the state of North Carolina also provided some PFAS funding. Georgia (and Florida) could also do this. Meanwhile, in Georgia, GA-EPD says it’s not their problem; talk to DPH. Frank Sanchez of DPH says his group would like to help, but they have no funding to do so. Also, DPH does not normally do sampling; DPH uses data generated by EPA or GA-EPD. He has also worked with other Riverkeepers to get sample data. Suwannee Riverkeeper is discussing further with Sanchez of DPH. There are businesses in the community that can perform a number of tests to see if a resident’s water is safe or not. The tests, however, would have to be done on the resident’s dime and would not be paid for by the county. Moody Air Force Base celebrated during a historical ceremony for the transfer of the Water and Wastewater Treatment Plant from a private contractor to Lowndes County, Oct. 3, in Valdosta, Ga.
Maybe Moody AFB can lead from the front on testing private wells, waterways, and fish for PFAS chemicals, leaked from that plant, and from other locations. Maybe Lowndes County, now in charge of that wastewater plant, can lead from the front on testing private wells, waterways, and fish. The county can save local citizens money by helping organize a group of private wells to test, thus getting a bulk rate. For that matter, have all of Lowndes County’s own wells been tested? What about all the subdivision wells, for which the county holds trust indentitures, making the county liable to take them over if the current owners default, including by not meeting water safety requirements? Meanwhile, if you want your well tested, you can sign up with this google form. WWALS will keep your information confidential. When we find out how to do this testing, we will relay your information to whichever organization will actually do the testing. You will be responsible for all costs of your tests, unless some funding source is found. To me, it’s reprehensible, cowardly, and disrespectful for the air base to not come forward immediately and ask anyone who might be affected if they would like to have their water tested. And if the tests show contamination, the base should immediately pay to rectify the situation…….after all, they’re responsible.